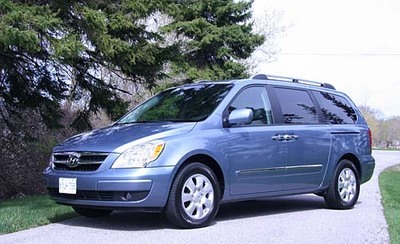 Hyundai has now entered the minivan market with its 2007 Entourage, a full sized minivan with four side doors and a large tailgate. At first glance the Entourage certainly looks like a serious competitor: Clean lines and expensive looking projector style headlamps which are mounted into curved fenders that sweep rearward and are integrated into the side panels. Entourage is built on a platform that is shared with its corporate cousin, the Kia Sedona. Both vehicles also share quite a bit of equipment including, drivetrain, some interior features and switch gear. Throughout the Entourage’s development, Hyundai sought to challenge the perceived leaders in this market segment — the Honda Odyssey and the Toyota Sienna. Market research also pointed out that price alone was not going to unseat buyers from the Honda and Toyota products. Domestic manufacturers were already selling vans based on price and convenience features, so to carve out a niche, Hyundai had to blend the attraction of a lower price with the perceived quality and value of a traditional import brand. Hyundai can now also boast that their Entourage has an overall length greater than the Toyota, Honda or Dodge Grand Caravan. The Entourage comes in four trim levels: GL, GL comfort, GLS and GLS premium. The base GL comes with a pretty full packet of features and is most noticeable by the lack of chrome door handles. And if you’re riding on 16 inch steel wheels, you know you’re in a GL as opposed to the GL Comfort which has 16 inch alloy wheels. The GLS models have chrome door handles and 17 inch alloy wheels, while the premium model adds leather seating and a power tailgate. Power windows are standard up front on the GL, while the GL Comfort and GLS models gets power second row windows and dual rear power sliding doors. With the second row of window lifts, Hyundai has added another feature which is found mostly on the Japanese branded mini-vans. Dual zone air conditioning with separate second row controls are standard on all models, with the GL Comfort and GLS models getting an automatic front climate control system. Interior utility is excellent with no less than 13 cup holders scattered around the cabin. Little touches include the fold away conversation mirror that allows you to keep a quiet eye on your kids in the rear rows. There are deep storage areas behind the rear seat and the integrated hooks on the rear of the third row of seats are handy for hanging grocery bags. The Entourage has the second highest interior volume of the minivans currently available. The 10.2 inch DVD entertainment system available in the Entourage is currently the largest standard screen available in a minivan and is priced as an $1,100 option on most trim levels but is standard on the GLS premium. Other import competitors charge a minimum of $2,000 for the DVD option and some package it together with other goodies to bring the cost of mobile movies to over $4K. Safety is one of the main selling points in this segment and Hyundai has equipped the Entourage with 4 wheel anti lock disc brakes with Electronic Brake Force Distribution. GLS models get Electronic Stability Control and Traction Control as standard equipment. Every trim level gets six standard airbags including two front and two side bags for the front passengers and two roof mounted side curtain bags that protect the side passengers in the two rear rows. Active front headrests that assist in preventing whiplash, helped the Entourage score the Insurance Institute for Highway Safety’s (IIHS) Gold Top Safety Pick award. The engine used on all models is the butter smooth 3.8L V6 found in the Hyundai Azera, which is fitted to a 5 speed automatic transmission with manually shifted “Shiftronic” over ride. The power plant produces 242 hp at 6000 rpm and 251 lb ft of torque at a very useable 3,500 rpm. In one way or another, the engine manages to best almost all of the competitors in either torque or horsepower ratings. In this category, I would suggest that torque is perhaps the most significant figure to be considered and the 3.8L engine does not disappoint in moving the Entourage off the line. Another bonus of this engine is that it is manufactured with timing chains in place of timing belts, which eliminates the need to undertake major maintenance normally expected once the vehicle exceeds 100,000 kilometres. On the road the Entourage displays a refined ride and excellent visibility from not only the driver’s seat looking forward, but even with third row passengers, rearward vision was unimpeded. Another safety refinement is that although the Entourage uses large outside mirrors, they are fixed to the vehicle by thinner moldings which allows for better sightlines around the “A” pillar. This allows drivers to see pedestrians at intersections and crossing streets. The seating arrangement in the Entourage was designed to blend function with comfort. The 60/40 split folding seat allows the middle passenger in the rear row to have a full seat, instead of straddling a split cushion that is a typical of 50/50 design. The rear seat can fold flush into the floor with a fairly easy maneuver using one hand. The middle seats are separated with a wide gap to allow ease of entry to the rear seats but they can also fold forward with the lift of a lever to allow more access to the rear or make room for storage. The middle seats are also mounted on casters allowing them to be rolled around when removed from the vehicle for maximum storage. All seating in the Entourage was well padded and appeared capable of providing comfort for a long journey. The middle row can slide forward and back to accommodate legroom requirements and the rear seats can recline for added comfort. Pricing for the Entourage starts at $29,995 for the GL, $31,995 for the GL Comfort, $35,695 for the GLS and $37,195 for the top of the line GLS Premium. Expect to see quite a few of these sharp looking family haulers on the road in the years to come. The basic package and the range of options offered has created an impressive alternative to the many other vans on the market at a price many consumers will find hard to overlook. Given the advances Hyundai has made in the past few years with its attention to quality and product development, consumers should be seeing resale values of Hyundai products climbing which has always reflected the true cost of ownership.